As you can see in the photos, the Rockwell’s battery attaches via a shoe connector, much like the DeWalt 12V MAX line. The battery protrudes forward slightly, which should help to balance it a bit, and though the Rockwell’s battery doesn’t include a charge gauge, the tool does flash the integrated LED work light to indicate that the battery is nearly dead. We see lots of the now-industry-standard rubber molding that makes the grip more comfortable, and we spy a pretty large (though not necessarily deep) trigger as well. The Rockwell’s chuck is a keyless type with an auto spindle lock, which should make tightening a lot easier. (Seriously, every drill should have one of these now. I’m not sure I’d want to own one that doesn’t.) The information we received from Rockwell doesn’t specify the chuck material, but from the photos, it looks plastic to us. Note that this isn’t necessarily a bad thing; we see an all-metal chuck as more critical in high-torque/heavy-use drill/drivers, generally starting with 18V and up. Of course, as this driver is designed to straddle the line between 12V and 18V, the importance of chuck durability will vary based on whether you intend to use it as a light-duty 18V or a heavy-duty 12V. 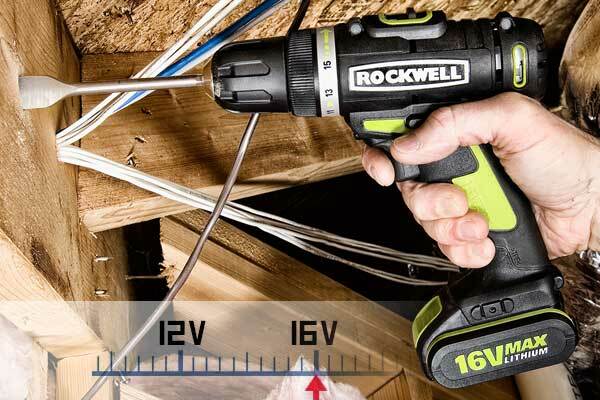 Rockwell claims that the 16V drill/driver delivers 302 in-lbs. of torque. Though they don’t specify the RPM at which they captured this reading, we might be able to infer a bit from the other specs, specifically that the 16V features a two-speed transmission, delivering 0-400 and 0-1,500 RPM (no load). The Bosch PS31, for example, claims 265 in-lbs. of torque with 0-350 and 0-1,300 RPM ranges. Assuming that the readings are taken somewhere in the low gear, we can guess that the torque measurement of the Bosch is taken at a lower RPM than the Rockwell, magnifying the Rockwell’s 37 in-lb. advantage. So unless someone fudged their numbers, we suspect the Rockwell delivers more torque than the Bosch PS31. The tough part is comparing the Rockwell to the DeWalt DCD710S2, since a while back DeWalt adopted the possibly-more-accurate-but-damn-near-impossible-to-compare unit watts out (UWO) power spec. Worse, this is probably the most apt comparison as the Rockwell and the DeWalt seem very similar in shape. (The Bosch follows the more compact PS form factor.) So we’ll have to wait until we can get one of these in hand to give you a practical comparison of power. Bulk is even tougher to judge at this early stage since Rockwell didn’t provide size specs — and “bulk” doesn’t really correlate directly with size, anyway. At the simplest level, we figure “less bulky” should translate to a thinner, simpler tool — as well as one that weighs significantly less. Of course, the key factor in terms of size, shape, and weight will be what you’re going to do with it. You might, for example, be way more concerned with the length of the drill’s barrel than its height if you were going to use it in certain tight spaces. 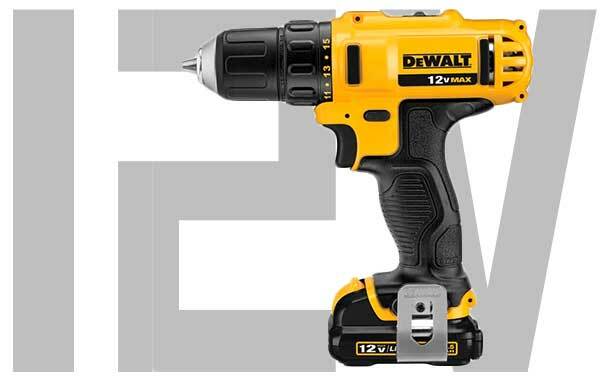 A big concern here, too, will be how the Rockwell compares the the DeWalt 12V. 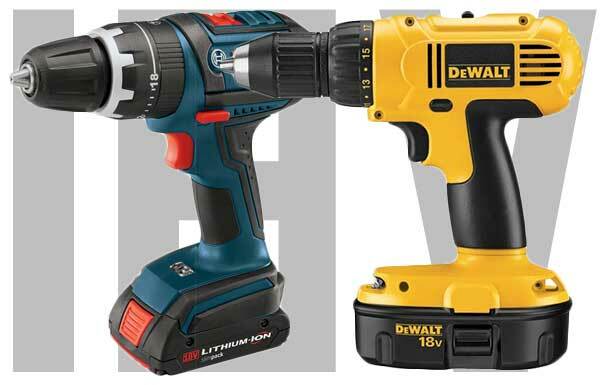 The Rockwell appears questionably less bulky than DeWalt’s 18V offering, but not so much compared to the 12V. We know a lot of you have questions about the quality of Rockwell as the name has changed hands a number of times. We do, too. But we’re not prepared to jump on the “it changed hands so it has to be bad” boat. We want to see it, use it, and judge for ourselves. And we have high hopes. Rockwell currently belongs to Positec Group, which also produces Worx. Years back we came out as fans of , and we continued to use it (and abuse it, honestly) around the shop for six years before we ran into . If this drill holds up similarly, that’s fine in our book. It’s worth noting, too, that Rockwell offers a battery replacement program similar to Ridgid’s in which they’ll replace your batteries for the life of the tool. Rockwell claims that represents a 40% to 70% reduction in ownership cost, and if you’re using the tool regularly, we’d say that’s not unreasonable. We’re interested to see these in person. If they significantly outperform the DeWalt 12V offering — and aren’t too heavy, clunky, or otherwise hobbled by issues — this might represent the filling of another gap in the use case/performance continuum. MSRP for the drill (RK2600K2) is $140, as is the impact driver (RK2611K2). You should see them on shelves starting late this month, and Rockwell has already secured distribution through Menards as well as other unspecified “regional hardware and home centers nationwide.” We’re sure you’ll see them online as well. To stave off any confusion here, the Bosch drill pictured is not the PS31 referenced in the text. PS31 is a 12v tool. Indeed. Wanted to show the two 18V compacts for comparison. Probably should have included the PS31 in the 12V section photo. Milwaukee’s 12V Drill offers more peak torque and 0-450/0-1700 RPM. Great article..well written. Quick question that nags at me regarding cordless drivers / drills: I have 18v NiCad tools and everything coming out that is hot or new is Lithium powered. Is it really worth it to upgrade or is it just tool envy? Rockwell has just announced a new 16V Lithiumtech line to fill the gap between 18/20v and 12v tools. The 16V Impact Driver RK2611K2 is only 4.9″ long which is very short for compact spaces. It has 950 in-lbs of torque which pretty much edges out all 12V Impacts except for Milwaukee’s upcoming brushless M12 FUEL. It ties the 12v DeWALT DCF815 at 950 in-lbs of torque. 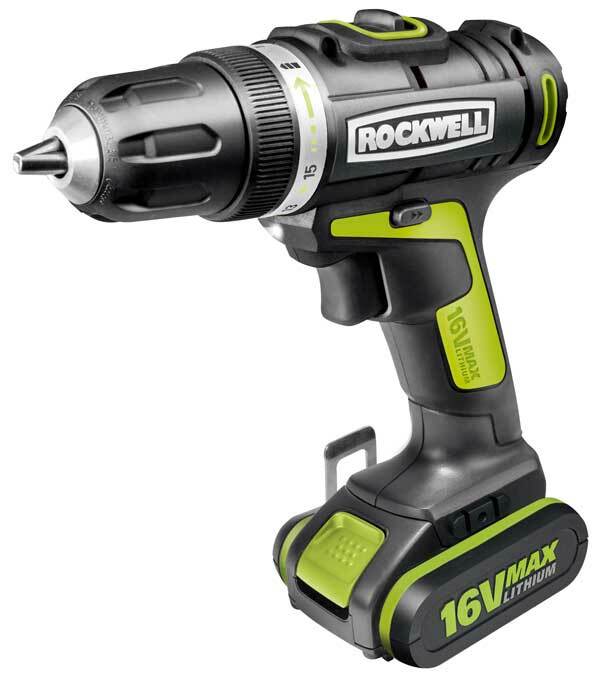 The Rockwell 16V Drill/DCF815Driver RK2600K2 has 302 in-lbs of torque. It has a 16 torque setting clutch, spindle lock and a two-speed (0-400/0-1500, no-load rpm) gearbox. Both tools come with a 30 minute charger and two 1.3 Ah batteries. The great thing about Rockwell is that if you register your tool you get free batteries for life. So when your battery is toast, you can swap it out for a new for free. Both tools are priced at $139.99 each. Groundhog day early this year? The great thing about Rockwell is that if you register your tool you get free batteries for life. If that’s the case, then Ridgid and Rockwell might soon be the only power tools worth buying for the long term. Have you ever actually tried to exchange batteries under the Rigid “lifetime warranty?” I have heard some horror stories about the batteries being gone for weeks at a time and then when the customer is told to pick them up, they receive their old batteries back because they were tested to hold a “nominal charge” and then they charge you for the round trip shipping. Apparently, the fine print says the batteries need to be actually dead, not just dying, dead. I suppose ymmv but I wouldn’t trust either one of these “lifetime warranties” for anything past the paper they’re written on. Charlie, I’m no expert and I quit using my tools to make money almost 20 years ago. That said, I think it depends on what you do. As just a homeowner and hobbyist now, my NiCads work well. However, I’ve been slowly adding the DeWalt 12v Lithiums over Father’s day and such and love having a small set of tools I keep in the house. For the 18v stuff I use less often, I really like my Ryobi circular saw. I recently added the blower and pruner which meet my needs around the house. AND, their 18v Lithium fits all my old Ryobi NiCads like the circular saw–an easy way to slowly switch. I agree. The lithiums are lighter and last longer with more power. Kudos to the companies that are continuing to allow you to use legacy tools with new batteries and continuing to expand their line (craftsman C3 comes to mind). I just wish they would come out with small bundles of “other” tools besides the usual drill combo to get people into the new lithium batteries. Bundle a sander or something with a lithium and charger since everyone has a bunch of drills already. I’ve got the full line of DeWalt, and two of the small Bosch drill drivers, and Bosch just doesn’t hold up. They’re like Makita in that they’re geared toward home owners and not professionals. Do yourselves a favor, buy DeWalt or the new Rockwell. I’ve got the new Rockwell sonicrafter and it’s an absolutely great tool, in my opinion it out performs both Fein and Bosch. Are you speaking of small drill/drivers only? The Makita tools I own ( 4 of the 18 volt LXT series, a rotary hammer, a reciprocating saw and an old 10mm drill) have not failed me. I have had problems with Bosch (a reciprocating saw that must be unplugged to stop and the plug end of a Bosch drill that burned up). Probably just 14.4V tools rebadged as “16V” as a gimmick, just like how the Bosch “12V Max” tools are really 10.8V. I suppose it adds something to seperate them other than tool color and design and price, I guess they figured people were getting tired of the same old 12, 14.4 and 18V options, and the 20,24,32V, etc. both sounded expensive and were expensive – and large and heavy. Not sure if anyone is still checking this blog, but just got a 15.64 volt reading on my Rockwell 16 v drill. I havent recharged it for a couple of days, but have been using it regularly!